This article is an introduction to Distribution Frames. Here we will be covering the main types of distribution frames. These are a staple item in the data world, and 90% of you have likely been asked for one or have sold a few. Basic as they are, there are many varieties, and depending on their intended use they may be referred to in a multitude of ways. This article should help you have a little better understanding of the basic things you are likely to come across. 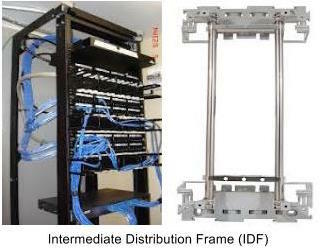 An Intermediate Distribution Frame (IDF) is a free-standing or wall-mounted rack unit for managing and interconnecting the telecommunications cable between end-user devices and a main distribution frame (MDF). For example, an IDF might be located on each floor of a multi-floor building, routing the cabling down the walls to an MDF on the first floor. The MDF would contain cabling that would interconnect to the phone company or to other buildings. 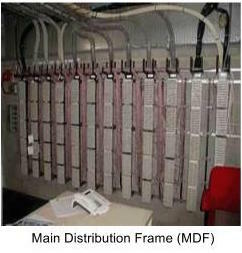 A Main Distribution frame (MDF or main frame) is a signal distribution point for connecting equipment inside a building to cables and equipment outside the building. Basically it is a termination point for incoming phone cable to connect to. The MDF is a termination point from the local exchange where exchange equipment and terminations are connected by jumper wires at the MDF. All copper cable pairs supplying services through telephone lines are then terminated at the MDF and distributed through the MDF to equipment inside the building from the local exchange. Like other Main Distribution frames, the MDF provides flexibility in assigning facilities at lower cost and higher capacity than a patch panel. What is the difference between Back Mount frames and Profil Frames? 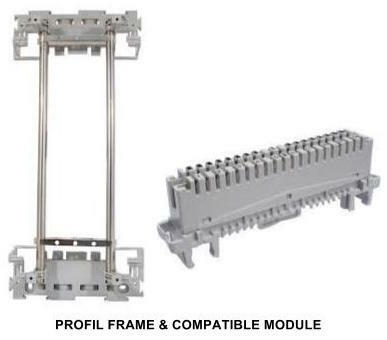 The only real difference between Back Mount & Profil Frames is the way disconnect modules mount on them. Back Mount frames have “teeth” which will need a disconnect module that has clips at the end to loop over the teeth - as shown in the below images. This means that an 11 way frame will have 11 “teeth” or positions for modules, normally to allow 10 disconnect modules and one label meaning an 11 way frame will do 100prs of copper. A Profil Frame has 2 parallel bars running between mounting blocks; these require a disconnect module that has clips underneath the module to clip down onto the parallel bars of the frame. Whilst there are no designated positions on them like Back Mount frames, they are still referred to as 11 way, 27 way etc. ADC Communications disconnect modules will fit either frame, while Stronglink are designed for back mount only.